As The Torah Encyclopedia of the Animal Kingdom takes shape, I've been accumulating pictures for the book. Most of the pictures are photos; the quality of wildlife photography available today, if you look hard enough for it, is truly amazing. But of course I also want to include illustrations of animals which appear in Jewish settings, such as Torah literature and synagogue architecture. In some cases this expresses the symbolism of the animal as discussed in the encyclopedia, such as the illustration of an elephant that appears on the front page of a 14th-century Sefer Devarim. The elephant is somewhat of a rare find; much more common are classically symbolic animals such as lions and deer. 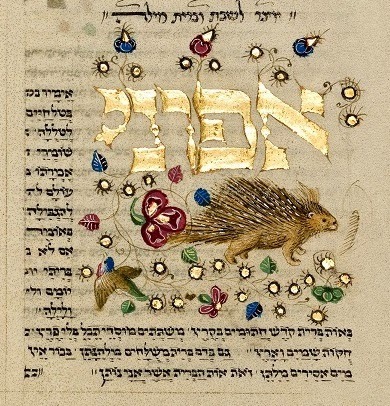 But there is one animal in my encyclopedia that I was extremely surprised to find depicted in an ancient Jewish manuscript: the crested porcupine, called kuppod in the Mishnah (contrast this with the Modern Hebrew name for the hedgehog, kippod). It appears in the famous 15th-century Rothschild Miscellany, alongside a yotzer that is recited on a Shabbos on which a bris milah is performed. But what is the connection between a porcupine and a bris milah? Is it that both involve painful incisions? That seems somewhat of a stretch! I consulted with historians of Jewish art and of Italian Jewish culture with regard to this prickly problem, and nobody was able to come up with anything. But since the same section of the Rothschild Miscellany also includes pictures of deer, leopards, and cheetahs (which, amazingly, is drawn very distinctly from the leopard), perhaps the porcupine has no particular significance, and is just a random animal. Still, the porcupine is a very different sort of creature from such heraldic creatures as deer and leopards, and it seems like somewhat of an odd choice. Meanwhile, over the last two weeks I've been struggling, together with my book designer Raphael Freeman, to overcome yet another design challenge with the encyclopedia. We were grappling with the problem that sometimes it was difficult to easily and rapidly distinguish between the text written by me and the quotations from the Gemara (because sometimes there are several short quotations interspersed with brief fragments of main text). After much thought and experiment, we came up with what seems to me to be a great solution: having a pale-colored vertical bar next to those quotations, to complement the parchment-style vertical bar next to the Scriptural quotations. This will also help the reader who is searching for a particular Gemara, as well as enhancing the aesthetics of the book (at least in our view). Please take a look at the newly revised PDF for the leopard chapter and let me know what you think! Actually, coincidentally I am reading a book about porcupines right now and apparently they were heraldic animals in France. I don't have the book on me right now, but i'll check tonight and come back with the reference. But there aren't any porcupines in France! Only hedgehogs, which are very different animals. if i recall correctly that was the point they made in the book, that they were modeling off of something that they didn't have or something like that. i get you the reference tonight, bli neder. Porcupines were actually on the top of the French medieval heraldic list, all the way to the emblem of Louis XII. Rav Slifkin, there weren't any lions, dragons, elephants, catoblepas, mermaids or basilisks either. New design looks great and very easy now to distinguish you from sources. Have you been been in touch with places like YU and JTS to try to get access to their rare books and manuscripts? I feel like that may be a good place to find some pictures. Also, Marc Shapiro always seems to hunt down rare finds. Maybe he has material. Is the porcupine-bris milah connection perhaps a pun, one which would be somewhat off-color in today’s English (והמבין יבין)? The two animals on that page are that porcupine and a bird. The kupod of Yeshayahu 34:11 is translated in the KJB as a bittern (others have pelican). True, the depicted bird is not very heron like the miscellany predates the KJB but it is (to my eye) and interesting choice of 2 animals on that page. The different vertical bars are a great, subtle way to distinguish your different source types. Thanks for sharing these design questions and decisions; it's fascinating to learn what goes into publishing a complex reference text. I have to look at an etymology dictionary but the vowel root קפד means to trim or prune. So maybe that is the tie between the Brit and the Kipod?? One of the old shuls in Venice has wild animals on one of the walls. This reminds me of the illustrations of rabbits or rabbit hunts that are often found in medieval illuminated haggadot next to kiddush, since the mnemonic "yaknehaz" (יין, קידוש, נר, הבדלה, זמן) sounds like the German phrase "jag den has", which means "hunt the rabbit". The rabbit illustrations served as a little reminder in the haggadot about what to do when the seder fell on Motzei Shabbat. "But the myth of porcupine quill-throwing preceded the discovery of America and the New World porcupine. The crested porcupine- which served as the heraldic emblem of the House of Orleans and, briefly, as the royal seal of France- was often pictured as launching a blizzard of quills against its enemies. This may have represented wishful thinking on the part of the French: one wants one's heraldic animal to project power. And since the porcupine was absent in France, who could challenge the myth?" 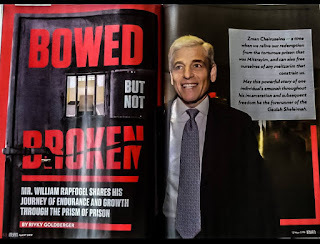 The author does not indicate where the information came from, but there is a very long bibliogrpahy in the back of the book, so i would assume it's buried in one of those books or articles. Dov Moses, I noticed that the gematria of קופד is the same as קצ. I hate to be a spoiled sport, but I like the old look better. I'm not even sure I understand the problem with the way it was before. Anyways.. just my opinion. Whatever you go with, I wish you the best of luck. Have you thought of including mythological creatures mentioned in Ketuvim and the Gemara such as the Leviathan and unicorn? These creatures, along with the griffin, are found on still-extant painted synagogue ceilings in Poland and Ukraine that date as early as the 18th century. I am sure you are aware of antique Judaica ---- Jewish ceremonial objects made in all types of mediums ---- that feature both real and the fantasy beasts previously mentioned, that are engraved, carved, or repoussed on said objects. A kiddush cup with squirrels, a Torah shield with unicorns and much more will be featured in my book "Jewish Antiques: From Menorahs to Seltzer Bottles" (Schiffer Publishing, October 2014), and you are welcome to contact me if you would like any images that will be in this book, as they are all owned by me, as they are from my personal collection. Radak says that קפד is ענין כריתה (which fits well with ברית). See also the Latin(?) footnotes 2 and 3. -is used both for the porcupine and the bird. Are there no porcupines in Israel? I'm wondering why the same word is used for porcupine and hedgehog. If they existed in distinct areas, it would explain things. If they live side by side, they are of course easily confused, but then the same word would serve for both, and it does not. The little metal plaques the Yeshurun Synagogue in Yerushalayim gives out to tell you what kibbud you're getting (kohen, hagba, etc.) has a leopard, deer, eagle, and lion on it, as in Pirkei Avot. I noticed this week that one of the mezuzot in the display in the lobby of the Great Synagogue down the block has a similar motif. re formatting; rather than bars all over the place you could simply have a medium size indent, perhaps in italics. Also there must be a better transliteration than "namer" (assuming i'm seeing the same thing as what is actually there), perhaps na'mer. As for the line to indicate quotations, I have no strong feelings one way or the other, but I'm with Yehudah. I believe that, as in all other books, the indentations are sufficient to indicate the quotations, particularly since after each quote the source is given at the end, further indicating it is a quote. Nachum said, "I'm wondering why the same word is used for porcupine and hedgehog. Judging from their names, they both appear to be understood by whoever named them as being some sort of pig, (from the shapes of their bellies?).. "porc-upine" would mean a pig with pines. In the margins of Mishnah Kelayim and Tiferes Yisrael there we find the word שטעכענשוויין - "needle pig"
Then the "hedge-hog" must be the pig from the hedges? I quite like the change; still hate the faux parchment. PLEASE get rid of it. I'd quite like to be able to read this book without having to cringe every time one of them came up.